Scholastic Canada | How Do Dinosaurs...? How Do Dinosaurs Go Up and Down? A book of opposites from the bestselling How Do Dinosaurs series! Win inventive gatefold flaps on every spread, these classic, bestselling characters from Jane Yolen and Mark Teague are a perfect introduction to basic opposite concepts. Young readers will love to open the gatefold flaps and read this uproarious book again and again! From How Do Dinosaurs Go Up and Down? © 2011 by Jane Yolen and Mark Teague. All rights reserved. Jane Yolen started writing poems before she got to school. She wrote the class musical in first grade — both words and music. It was about a bunch of vegetables who got together in a salad. Jane played the chief carrot! While she was in junior high, Jane wrote an entire essay in rhyme about manufacturing in New York State. In high school, she won a Scholastic poetry contest. In college, she wrote newspaper articles and songs. Then, on her 21st birthday, she sold her first book. It was a nonfiction book about women pirates — Pirates in Petticoats. After that, Jane was a book writer for good. She’s also been an editor, a teacher, a storyteller, a critic, a songwriter for rock groups and folk singers — as well as a mother and now a grandmother. Jane has been married for 35 years to Dr. David Stemple, who is the chairman of a university computer science department. Despite this, she only started using a computer for writing a few years ago! Before then, she wrote on a typewriter, endlessly revising. She’s written more than 300 books for children. Her books and stories have won the Caldecott Medal, two Nebula awards, two Christopher medals, the World Fantasy Award, three Mythopoeic Fantasy awards, the Golden Kite Award, the Jewish Book Award, the World Fantasy Association’s Lifetime Achievement Award, and the Association of Jewish Libraries Award, among many others. As with all great discoveries, Mark Teague's eureka moment materialized from something seemingly unrelated, when a move from San Diego to New York City planted the seed for his first picture book, The Trouble with the Johnsons. His debut earned him a feature in Publishers Weekly as one of eleven prominent new authors of 1989 and secured his place among beloved children's authors. Each of Mark's books starts as "notebooks full of sketches and scribbles, strange little drawings, and phrases that seem mostly cryptic that suddenly come together," he explains. And though Mark developed his writing and painting talents without formal training, his boundless imagination has earned him a permanent place in the hearts of children. His books tackle common childhood fears — imaginary monsters living in closets, being late for school, or meeting a new baby-sitter. One Halloween Night sprung from his love for the holiday — the way a costume can give a person a whole new identity and how everything is transformed into something mysterious and spooky. Mark has also collaborated with critically acclaimed authors Audrey Wood, Cynthia Rylant, and Jane Yolen. He and Jane created the award-winning How Do Dinosaurs... series. The first book in the series, How Do Dinosaurs Say Goodnight?, was named a New York Times, Publishers Weekly, and BookSense bestseller. It also picked up numerous prizes, including the Christopher Medal. The sequels have been published to critical acclaim as well. Mark currently lives in Coxsackie, New York, with his wife, Laura, and their two daughters, Lily and Ava. Images © 2004 by Mark Teague from How Do Dinosaurs Count to Ten? by Jane Yolen. All Rights Reserved. 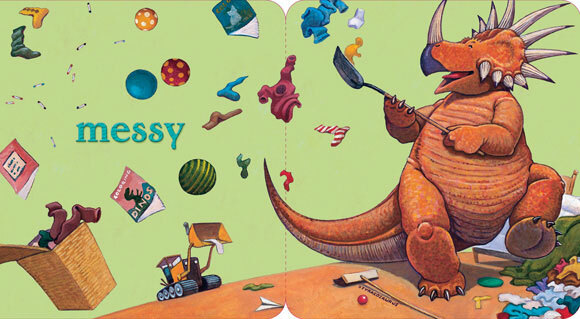 Images © 2004 by Mark Teague from How Do Dinosaurs Clean Their Rooms? by Jane Yolen. All Rights Reserved. Images © 2007 by Mark Teague from How Do Dinosaurs Learn Their Colors? by Jane Yolen. All Rights Reserved. Images © 2007 by Mark Teague from How Do Dinosaurs Go To School? by Jane Yolen. All Rights Reserved. Images © 2007 by Mark Teague from How Do Dinosaurs Eat Their Food? by Jane Yolen. All Rights Reserved. Images © 2012 by Mark Teague from How Do Dinosaurs Say Merry Christmas? by Jane Yolen. All Rights Reserved. Images © 2012 by Mark Teague from How Do Dinosaurs Say Happy Chanukah? by Jane Yolen. All Rights Reserved.